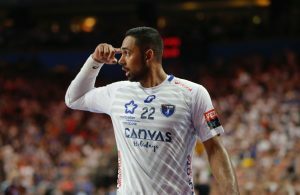 From the “second row” French Montpellier Handball looking to find the way in the “first class” of European handball – once again. After leaders of French LidlStarLigue beat PGE Vive Kielce last year at TOP 16 phase, Patrice Canayer is ready to fight for another surprise – this time against FC Barcelona Lassa next weekend at “Blaugrana”. First clash ended with Montpellier’s home win 28:25. The main r ole in the winning squad had Lithuanian left back Jonas Truchanovicius with eight goals. “The best buy” of the French team in the last few seasons, the 24-years old shooter, was a match winner among much bigger names and stars of handball. Of course, we are happy with the result in the first match, but also understand that this was just the first half of the TOP 16 clash. It was a good and tough match, but that is expected when you play against team like Barca. What is the biggest strentgh of FC Barcelona Lassa? That is the whole team of Barca. They have very good players on every position, which can play and win the biggest matches. They have very balanced roster. If you progress to TOP 8 should journalists still name as surprise based on how you play this season? Maybe, but at the end of the day, I would still say that we were the underdogs of this matchup . They played at EHF CL Final4 last seasons, they are big team, so if it would happen I would call it a pleasant surprise. We know for all German teams that they put trophy in DKB Bundesliga ahead of EHF Champions League. What is more important for Montpellier in the moment – domestic or international? Everything is important for us. We do not give priorities as we are hungry for all. How is working with Patrice Canayer? Tell us something about him, which kind of system he is forcing? Working with Patrice Canayer is really wonderful, I like his professionalism and view of handball. He is really experienced. He has been a coach for many years and you just feel his knowledge about handball. In 5-6 words, how would you describe current roster of Montpellier Handball? Young, enthusiastic, promising, determined and motivated. Will you survive in race with PSG Handball for LNH title? Well, everything is in our hands, so of course we will give our best to maintain the top spot. For the guy who played in Austrian league two years ago, you exploded in Montpellier’s jersey. How do you see your career? Progress of this jump in my career is built on the hard work I was putting before and continuing to do now. There were a lot of ups and downs in my early start of career, but at the end, I got a chance to show myself in Montpellier. I grabbed this opportunity with all my heart. When we gonna see Lithuania on big competitions like EURO or World Championships? Last year we made a good run for the EURO 2018, considering that we had Norway and France in our group. I think we are moving in a good way, so I hope that we will continue – concludes Jonas Truchanovicius who came from Austrian Union Leoben to Montpellier in summer 2016.